An Underlying Problem: But Can Philanthropy Help Close the "Global Trust Deficit?" For decades, polling has tracked a decline in public trust of key institutions in U.S. society—government, business, organized religion and the media. For example, trust in Congress has hit some of the lowest levels ever in recent years, while the media has fared only marginally better. In September, Gallup reported that Americans' trust and confidence in the mass media "to report the news fully, accurately and fairly" has dropped to its lowest level in its polling history, with 32 percent saying they have a great deal or fair amount of trust in the media. Findings like these, of course, help explain why so many voters were ready to roll the dice on a presidential candidate who showed open disdain for many American institutions. The United States is not alone in facing a trust crisis. On the contrary, things are even worse in some other countries, and experts talk about a "global trust deficit." The 2017 Edelman Trust Barometer found that two-thirds of the 28 countries surveyed are now "distrusters," meaning less than 50 percent of a country’s respondents trust in the mainstream institutions of business, government, media, and NGOs to do what is right. Additionally, Edelman found that trust in the media has declined sharply with media institutions being distrusted in 82 percent of countries. Low levels of trust in society makes it harder to solve any number of big problems, since citizens are less likely to provide key institutions with the support and resources they need to advance solutions. Low trust also erodes civil discourse. It feeds divisions based on class, gender and race. It leads people to hunker down in respective echo chambers. Like the iconic 1960 Twilight Zone episode "The Monsters Are Due on Maple Street," it sows suspicion and turns neighbor against neighbor. 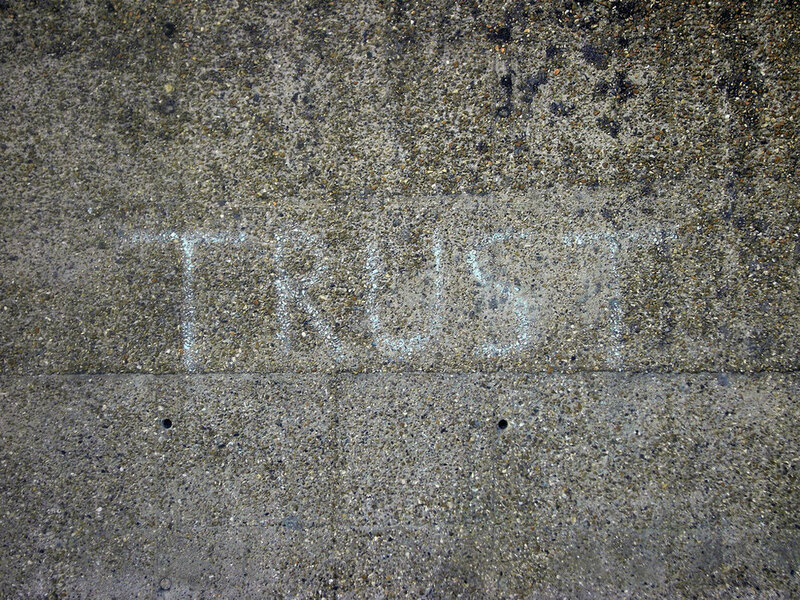 Ultimately, low trust leaves societies vulnerable to authoritarian leaders who promise to restore unity and order. All of which is why philanthropy has a major stake in tackling the global trust deficit. But what can funders actually do in regard to such an all-encompassing challenge? Over the past few years, we've covered initiatives that address this challenge from various angles and in various places. The Hewlett Foundation, for example, has invested in efforts to improve government transparency in Africa so citizens can know what their leaders are doing—especially when it comes to public finances. In the United States, Hewlett is also investing heavily in trying to reduce polarization, a problem that's both fed by, and helps feed, low trust in institutions. Of course, the Open Society Foundations has a long history in this area, backing efforts to hold the powerful accountable on multiple continents. Among other things, OSF has lately been working with other funders to stop the weakening of South Africa's democratic institutions. But what we haven't seen is a single initiative to close the global trust deficit with a holistic funding strategy. Until this month, when the Omidyar Network allocated $100 million to this goal, looking to tackle multiple and interrelated challenges simultaneously, the idea being that the cumulative impact will be greater than the sum of its parts. The philanthropy of Pierre Omidyar, eBay founder and now Trump antagonizer, has been getting a lot of coverage on IP as of late. In January, Omidyar Network gifted $2.1 million to the Committee to Protect Journalists. In late March, we reported that the network would provide seed funding for an ADL center in Silicon Valley that will help digital companies find ways to fight online hate. In retrospect, it's as if these gifts were mere preludes to the grand $100 million crescendo announced in early April. In addition to the scale of the gift, this move corrals all of Omidyar's most treasured causes in one, all-encompassing commitment. The money, which runs over the next three years, will "tackle some of the root causes of the global trust deficit." Grants will focus on "strengthening independent media and investigative journalism, tackling misinformation and hate speech, and enabling citizens to better engage with government on critical issues." The International Consortium of Investigative Journalists (ICIJ), the group behind last year’s Panama Papers investigation, will be one of the first recipients of this funding. The organization will receive a three-year grant of up to $4.5 million to expand its investigative reporting. A lack of government responsiveness and a growing distrust in institutions, especially the media, are eroding trust. Increasingly, facts are being devalued, misinformation spread, accountability ignored, and channels that give citizens a voice withdrawn. These trends cannot become the norm, and we must protect the principles of openness, participation, and accountability. A trustworthy press is the immune system of democracy. As citizens, we can only make informed decisions when we have news we can trust. Independent investigative reporting is essential to shoot down false claims and expose bad actors. Yet even if we can all agree that the global trust deficit is a bad thing and should be closed, the $64,000 question—or in Omidyar's case, the $100 million question—is "How?" One tricky challenge, here, is that steps to expose corruption in government and other institutions can actually serve to fuel further distrust of these same institutions. Consider this case study. As previously noted, grant recipient ICIJ famously exposed the Panama Papers, consisting of 11.5 million leaked documents revealing offshore business entities linked to fraud, tax evasion and international sanction evasions. I wager that very few people who read reports about the Panama Papers sat back and said, "Phew, my faith in financial and government institutions is slowly being restored." If anything, the reports confirmed what most people knew: The system is rigged. It made people angry. It confirmed their cynicism. At a time when autocrats, demagogues, criminals, dodgy businessmen, and other shady characters are seeking to enrich and empower themselves at the expense of society, it is more important than ever that journalists can remain the world’s independent eyes and ears, and root out corruption and wrongdoing. Again, no disagreement there. But will this journalism actually increase trust in government in business institutions or just underscore people's worst fears? In the United States, the right often gets the lion's share of blame for undermining trust in government through unending attacks on the public sector. But it's worth pointing out that it's the left that often led efforts to expose corruption of key leaders. Watergate is considered a glorious victory for muckraking journalism—and it dealt a devastating blow to public trust in government. Investigations in the 1970s into the CIA and the Iran-Contra scandal of the 1980s, also high water marks in a new accountability push, also undermined such trust. If investigations bring down President Trump, as many progressives hope—and as some funders are working to make happen—millions of Americans voters who believed in him will see their hopes dashed and no doubt become even more cynical about elected leaders. Don't get me wrong. I'm not here to rain on Omidyar's parade, but instead to call attention to important factors involving human psychology that funders need to think about carefully as they move to boost investigative journalists and government accountability watchdogs—at least if the goal is promoting greater trust in institutions. Other strategies may be more effective at advancing that goal, such as efforts to empower citizens vis-a-vis more transparent public institutions. And, as we've reported, the Omidyar Network is also backing work in that and other areas, and this initiative, as noted, does aim to enable citizens to better engage with government on critical issues. Maybe what we're looking for is a clearer theory of change from this funder about how to close the global trust deficit and how, exactly, backing outfits like ICIJ fits into that theory. Hopefully, the Omidyar Network is aware of the unintended consequences of actions in this area and how ensuring accountability can work at cross purposes with the goal of strengthening public trust in institutions. These are tough issues, for sure. The good news, here, is that a funder with the resources and reach of the Omidyar Network is engaging the trust challenge in a larger and more holistic way.